For the village in Australia, see Cheshunt, Victoria. Cheshunt (/ˈtʃɛzənt/ CHEZ-ənt) is a town in the Borough of Broxbourne, Hertfordshire, lying entirely within the London Metropolitan Area and Greater London Urban Area. It is 12 miles (19 km) north of central London and has a population of around 52,000 according to the United Kingdom's 2001 Census. The Prime Meridian passes to the east of Cheshunt. 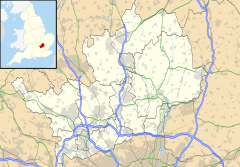 The town name comes from the Old English name (as recorded in the Domesday Book) for the area, Cestrehunt, which probably refers to a "castle, erected by the Romans", the word cestre (along with the form ceastre), or even its modern forms, chester and caster being derived from the Latin castrum meaning "fort". This is commemorated in the arms of the former Cheshunt urban district council. Cheshunt was a settlement on Ermine Street, the main Roman road leading north from London. This origin was investigated by the television archaeology programme Time Team. Before the Norman Conquest, the manor of Cheshunt was held by Eddeva the Fair, but William I granted it to Alan of Brittany. The parish church of St Mary the Virgin was first recorded in a charter of 1146, but was entirely rebuilt between 1418 and 1448 with a three-stage tower topped by an octagonal turret. As Princess Elizabeth, Queen Elizabeth I lived at Cheshunt in the care of Sir Anthony Denny, after she left Queen Catherine Parr's household in 1548. Richard Cromwell, Lord Protector of the Commonwealth, died here in 1712. In 1825, Cheshunt was also the location of the Cheshunt Railway. Running from the town's High Street to the River Lea near the present-day Cheshunt railway station, this 0.75 mi (1.21 km) horse-drawn line was the first passenger-carrying monorail and the first railway line to be built in Hertfordshire. The town's Bury Green neighbourhood was once the home of singer Cliff Richard. Lotus Cars as well as the central headquarters the Debenhams store chain were formerly located in Cheshunt, and the headquarters of Tesco, the UK's largest supermarket chain, was located here until 2016. In 2002, Cheshunt hosted the only officially licensed European BotCon convention so far. In 1957, a review of how London was governed was undertaken by government and led by Sir Edwin Herbert, who was appointed to create the new Greater London conurbation as it is today. Initially, Cheshunt was planned to be merged in with the London Borough of Enfield; however, the plan was eventually dropped and Cheshunt remained part of Hertfordshire. The Metropolitan Police Service served Cheshunt until 2000, when policing was taken over by Hertfordshire Constabulary. Services in Cheshunt include the Brookfield Centre, which includes Next, Boots, Argos, River Island and Marks & Spencer stores, as well as a large Tesco Extra store. There is a Marriott Hotel nearby, and the town centre includes a wide variety of smaller shops. Being located in the Lea Valley, Cheshunt has access to the Lee Valley Park. The park is accessible at many points, one being extremely close to the town's railway station at Windmill Lane. At 8:00 am on 12 August 1944, a Consolidated B-24 Liberator bomber from the United States Army Air Forces 392nd Bombardment Group (Heavy), based at RAF Wendling, crashed next to Maxwells Farm, near Cheshunt, killing all ten crew. The B198 which runs near the crash site has been renamed Lieutenant Ellis Way, after the pilot, who managed to avoid crashing into the nearby town. One of the firemen who attended the scene secured funding in 2010 for a permanent memorial at the scene. Up until 2004, Temple Bar stood in Theobalds Park, having been moved from London at the turn of the 19th century. The gateway has since been re-erected in London at Paternoster Square on the north side of St Paul's Cathedral. Cedars Park, Broxbourne, on the site of the historic Theobalds Palace, is a public park that covers 19 hectares (47 acres) of parkland and includes a lake, turf play maze, bocce court, play mound (Venusberg), pet's corner, flint arch and historic walls, tea room and arts centre. The park received a Green Flag award in 2013. Cheshunt's best-known employer used to be Tesco, whose head office was in Delamare Road, Cheshunt for many years. A small store has been in the town centre for many years and is still open today, together with "Home 'n' Wear" store (now closed) which was situated across the Old Pond in College Road. In 1983 a new out-of-town Tesco store located to the north of the town opened, named "Brookfield Farm". It later expanded, and a branch of Marks & Spencer built next door, the entire estate renamed "The Brookfield Centre". Tesco announced in 2015 that it would move its headquarters to Welwyn Garden City. In 1959, Colin Chapman moved his fledgling Lotus group of companies, including Lotus Cars and Team Lotus, from its outgrown premises at Hornsey to a purpose-built facility on Delamare Road. Racing cars from here won the first two of its seven constructor championships in (1963 and 1965) before moving to Hethel, Norfolk, in 1966. Until the late 1960s the main land use around Cheshunt was for its nursery industry, and many new techniques for growing under glass were developed here. Thomas Rochford had a large concern here, although now almost all the glasshouses have been redeveloped into housing estates. This is often reflected in the names of the roads or estates, such as Rosedale or Thomas Rochford Way. A small amount of nursery trade survives to the west of the town. The neighbouring town of Goffs Oak still has a large number of nurseries as well as a large garden centre. The River Lee Navigation passes alongside the east of Cheshunt and was used for the transport of flowers and crops to the London markets for many years until road transport became more viable. A wharf existed just east of the railway on the site now occupied by Herts Young Mariners Base. The Youth Hostel was built on the site of the derelict open-air swimming pool. Photos of the pool are exhibited at the hostel. "Cheshunt Compound", a fungicide developed at the Cheshunt Research Station was widely used by amateur and professional gardeners but has been withdrawn from sale in the UK since November 2010 and it is no longer legal to use it. It was a mixture of copper sulphate and ammonium carbonate. From the end of World War II a large area of the River Lea flood plain was used for sand and gravel extraction which resulted in the creation of the now mature lakes which are popular with anglers, birdwatchers and naturalists. The area now forms part of the 1,000 acres (400 ha) River Lee Country Park and the Turnford and Cheshunt Pits SSSI. Cliff Richard performing in Sydney, Australia. Victoria Beckham, singer, fashion designer attended school at St Mary's High School, Cheshunt. Cardinal Wolsey - was given land in Cheshunt by King Henry VIII. A small park at Goffs Lane 51°42′26″N 0°03′16″W﻿ / ﻿51.7071°N 0.0544°W﻿ / 51.7071; -0.0544 contains ruins of his manor - Cheshunt Great House. Wolsey Hall  a community centre is named after this ancestral resident. The Who once played at Wolsey Hall along with many other popular bands on 11 October 1964 under their then alter ego of The High Numbers. David Bentley - premiership football player with Arsenal and later Tottenham Hotspur attended Goffs School. Laura Kenny is the first British woman to win four Olympic Gold Medals. Cheshunt has four secondary schools: Goffs Churchgate; Haileybury Turnford; Goffs School; and St Mary's Church of England High School. The non-conformist theological college Cheshunt College, moved to Cheshunt in the 1790s from Trevecca, Brecknockshire. It moved to Cambridge in 1905. Between 1909 and 1968 the buildings were occupied by the Church of England's Bishop's College. 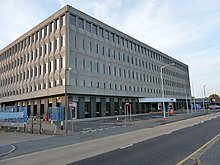 Since 1972 they have been council offices and formerly a music and business school (typing and accountancy), which had to be demolished due to it being unsafe. In the 80s parts of the building were so unsafe it was closed and demolished. The main problem was the floors had begun to disintegrate. A new council office was built on the site of the old school. The council chamber and registry office are now in the same building that contains the "Huntingdon Rooms". The Old Pond area is located in the centre of Cheshunt and is home to many local businesses. With roads leading to the M25, A10 and towards Broxbourne. Before the 2012 London Olympics the Olympic Torch was carried close to the Old Pond by selected and nominated local residents. After the Olympics, gold medal winner Laura Kenny had two postboxes painted gold in her honour, one at the Old Pond. Cheshunt's best-known son is the pop singer Cliff Richard and the town was also home to the band Unit 4 + 2 whose song "Concrete and Clay" topped the UK charts in 1965. UFO drummer Andy Parker was born in the town in the 1950s. The popular underground band Neils Children, originate from the town. Cheshunt has its own football Club in Cheshunt F.C. who play in the Isthmian League South Central Division. Founded in 1946, their most famous player was Iain Dowie who played for them in the 1980s. The town also has long-established rugby and cricket clubs and a publicly owned 18-hole golf course. Tottenham Hotspur football club, most notably, have held training grounds in Cheshunt over the years. Formerly Grundy Park Leisure Centre, the Laura Trott Leisure Centre was renamed after £4m redevelopment to honour the Olympic gold medallist. Trott attended the launch on the morning before competing in stage four of the first Women's Tour from Cheshunt to Welwyn Garden City. Cheshunt Station is located in Travelcard Zone 8. Nearby stations include Theobalds Grove, Waltham Cross, Turkey Street, and Loughton (Central Line). The station is on both the standard National Rail network and the London Overground network. Services run southbound to Liverpool Street via Tottenham Hale or Seven Sisters and Stratford and northbound to Hertford East, Bishop's Stortford and Cambridge. Crossrail 2 will connect north-east London to south-west London when constructed and is proposed to stop at Cheshunt station. Cheshunt is located on the A10 trunk road (also known locally as the Great Cambridge Road) which provides links to Junction 25 of the M25 London Orbital Motorway, Central London and Cambridge. Cheshunt has a mixture of commercial and Hertfordshire County Council contract services. Most buses operate to Waltham Cross (where there are links to north London and Essex), Hoddesdon and Broxbourne. The towns of Hertford, Harlow, Potters Bar, and Waltham Abbey are also linked to Cheshunt. Buses are operated by Arriva, Centrebus, Metroline or Sullivan Buses. The Sustrans National Cycle Route 1 passes through Cheshunt as part of its route connecting Dover to Shetland. The Lee Valley Country Park is a cycle-friendly route that runs along the River Lea, connecting both cyclists and pedestrians to Ware, Hoddesdon, Waltham Abbey, Tottenham and Stratford. Route of the cycle link and new bridge location. As part of the Connect2 project a new cycle link over the A10 was proposed in 2007. The scheme involved the building of a new cycle bridge over the A10 and connecting paths to link Theobalds Lane with Lieutenant Ellis Way. The bridge was opened in 2010 as the "Paul Cully Bridge" after a late local civil servant. £500,000 of this cost is funded by the Big Lottery Fund via the Connect2 project. Stains, Île-de-France, France; north of Paris. ^ Finchley Society (26 June 1997). "Finchley Society Annual General Meeting Minutes" (PDF). Archived from the original (PDF) on 4 December 2008. Retrieved 3 April 2009. ^ Today in Science History. "June 25 - Today in Science History". Retrieved 3 April 2009. ^ "The Herbert Commission: Here are the 52 London boroughs that could have been | CityMetric". www.citymetric.com. Retrieved 9 February 2018. ^ UK Parliament. Greater London Authority Act 1999 as amended (see also enacted form), from legislation.gov.uk. ^ UK Parliament. The Greater London Authority Act 1999 (Commencement No. 1) Order as made, from legislation.gov.uk. ^ "Ernie wins battle to honour US war heroes who saved Cheshunt". Hertfordshire Mercury. Archived from the original on 21 July 2011. ^ "Contacts". Tesco PLC. Retrieved 20 January 2016. ^ "Cheshunt gets its second gold postbox". Hertfordshire Mercury. Archived from the original on 8 December 2015. Retrieved 27 November 2015. ^ "Cheshunt Park Golf Centre". Archived from the original on 8 August 2014. ^ "Cheshunt's Grundy Park Leisure Centre renamed after Laura Trott ahead of Women's Tour stage four – SLIDESHOW". Hertfordshire Mercury. Archived from the original on 2015-01-29. ^ "London Crossrail 2 Webpage". Archived from the original on 15 March 2015. ^ "Cheshunt, crossing the A10 to reach the Lee Valley". Sustrans. Archived from the original on 19 October 2007. Retrieved 23 July 2009. ^ "Bridge Opening". Where we can walk. November 2010. Retrieved 1 May 2012. ^ "Borough of Broxbourne Minutes" (PDF). Broxbourne Borough Council. 22 July 2008. Archived from the original (PDF) on 27 September 2011. Retrieved 23 July 2009. Wikimedia Commons has media related to Cheshunt.